The Glenn R. Capp Debate Forum is commited to the promotion of argument and public advocacy. We believe that a well informed, articulate citizenry is crucial to the empowerment of the individual and the maintenance of a free society. Our program supports participation in intercollegiate competition, instruction in interscholastic competition as well as debates for the public forum. It is possible to "walk on" to the Baylor debate team without having been recruited by the coaching staff. There are several examples of walk-on debaters who have made the team and gone on to have outstanding careers. All of those debaters had significant high school debate experience. Most recently, Obie Lansford ('09) was an un-recruited debater who had four years of high school policy experience, and ended up at Baylor. Obie wasn't sure he wanted to debate as a freshman, but was talked into it. He went on to qualify for the NDT four consecutive years and was the Top Speaker at the 2009 District 3 Championship. Does Baylor participate in Individual Events or Lincoln-Douglas debate? What about Parlimentary Debate? No. Baylor has a rich tradition of success in intercollegiate policy debate dating back to 1865. We will continue this tradition by focusing on the policy arena. We feel that the policy debate format offers the most educational and competitive approach to the discussion of contemporary social issues. How prominent nationally is the debate program at Baylor? Baylor is a powerhouse in intercollegate policy debate. Baylor has won the NDT three times (1975, 1987, 1989), and appeared in the Final Four an additional nine times. Baylor's team of John Cook and Ashley Morgan advanced to the Quarterfinals at the 2011 NDT. Baylor has also had numerous top speakers at the NDT and won virtually every major national tournament at some point in its history. How many students participate in the Baylor debate program? The number of debaters at Baylor will vary from year to year, but generally about twelve students are part of the traveling squad. Is high school debate experience a requirement for participation? Yes. Preferably four years of top-level policy debate experience. There are some examples of students who have made the transition from Lincoln-Douglas or other styles of debate, but those success stories are few and far between. Because of the specialized nature of intercollegiate policy debate, exposure to and experience with that style is basically a necessity to participate meanigfully at this level. For example, if an individual wanted to play linebacker for the Baylor football team, but hadn't played football in high school, or had played baseball instead, that person would not have much of a reasonable expectation to walk-on to the Baylor football team, make the team, and win the starting job at middle linebacker. How much time does it take to participate in debate at Baylor? The amount of time a student spends on debate will vary with the debater's ability, motivation, and level of interest. Of course, participation in any worthwhile activity is time consuming. In addition to attending the squad meetings, debaters conduct extensive research, participate in practice rounds, and travel to tournaments. The amount of time a student is able to commit to debate will have a large impact upon the assignment of debate colleague and the selection of a tournament travel schedule. How are debate colleagues selected at Baylor? Colleagues are assigned by the coaches, but debaters have significant input into such decisions. We attempt to pair teams based on level of experience, desire, and ability level. How many tournaments can I expect to attend each year? The amount and type of travel is determined jointly by the individual team and the coaching staff. Students are not asked to travel at times that they prefer not to travel. The coaches make decisions about travel based upon student interest and level of preparedness. Some teams attend as few as one or two tournaments a semester; rarely will a team attend more than five tournaments a semester. What types of tournaments does Baylor attend? Baylor participates in NDT and CEDA debate at the college level, which is team debate involving policy resolutions (NDT stands for National Debate Tournament and CEDA stands for Cross-Examination Debate Association). We do not participate in individual events or Lincoln-Douglas debate competition. NDT and CEDA debate the same resolution for the entire season, with the following speaking format of 9-3-6 and 10 minutes of preparation. Baylor has chosen to participate in this style of debate since the beginning of the 'modern' era of college debate in 1947. How many classes are missed for tournament travel? 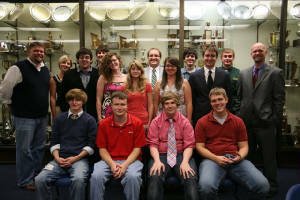 College debate tournaments are generally three day activities held Saturday through Monday. We typically leave for a tournament during the day on Friday and return on Monday evening. We usually drive to tournaments which are under 600 miles from Waco and fly to locations that are over 600 miles away. Whenever a student misses a class for a debate tournament, we provide a written notice to each of the student's professors indicating that classes will be missed for a University sanctioned activity. Students should, however, attempt to schedule as many Tuesday/Thursday classes as possible in order to minimize the number of classes missed. Since debaters enjoy the privilege of early registration, a schedule conducive to tournament travel is easily achieved. Is debate at Baylor a squad or an individual team effort? Most definitely, Baylor debate is a squad effort. College NDT topics are broad, and one team could not research a proposition adequately without jeopardizing grades in classes. Baylor's program relies on a central evidence file. Each debater is assigned a topic area for research. Blocks related to specific arguments and cases are then prepared and distributed to each team. Given the amount of time we spend together, the squad develops a camaraderie which surpasses that of most college groups. Students are as excited about others' victories as they are their own. Should I participate in debate my freshman year in college? Yes, why lose the opportunity of a year's debate experience in any activity that offers so many individual advantages? Students who aspire to achieve the highest level of national competition generally need to begin the activity in their freshman year. Can I participate in other activities while debating? While debate does take a great deal of time, debaters are encouraged to participate in other activities that will provide them with a well-rounded, broad-based college education. What other activities are available besides tournament travel? While tournament competition is the primary debate activity at Baylor, debaters also participate in public debate programs involving contemporary, controversial policy issues. Baylor debaters also judge in area high school tournaments as their schedule permits. Most Baylor debaters are also involved in teaching in the high school summer debate workshops held each year. Judging at tournaments and teaching in the high school summer debate workshops held each year can provide financial benefits to students. Can I receive college credit for participation in debate at Baylor? Yes, a debater can receive academic credit for participation in the debate program. While competitive tournament debate is an extra-curricular activity, the university recognizes the curricular value of debate and offers a student a total of 8 hours college credit for participation in debate. It is strongly recommended that incoming freshpersons interested in debate take CSS 1304 (Argumentation and Debate) in the fall semester. Can incoming students work in the summer workshop? Yes, some incoming first-year students are accepted for employment in the Baylor High School Debaters' workshops. Contact Dr.Gerber for more information. Are debate scholarships available at Baylor? Yes. Thanks to the generous contributions of many alumni of the Baylor debate program, and to the strong support that Baylor has always had for its debate team, we are blessed with substantial scholarship assistance for debaters. Annually, we award two of the prestigious Capp Fellowships to incoming debaters. These full-tuition awards are renewable for up to four years. There are also a limited number of smaller scholarships available for debaters. They are awarded or renewed annually based upon a student's ability, development, and dedication to the program.